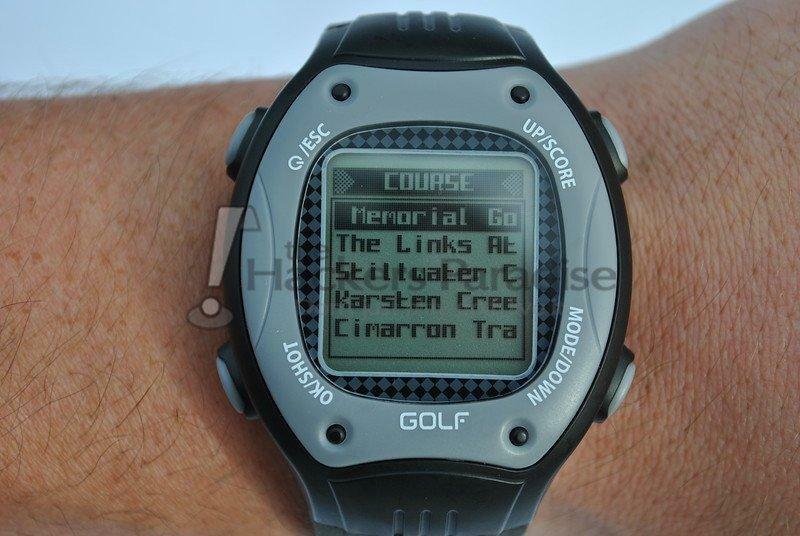 One of the more popular trends in golf continues to be the use of GPS Watches. As with anything, they come in all shapes and sizes and with different bells and whistles to set themselves apart. 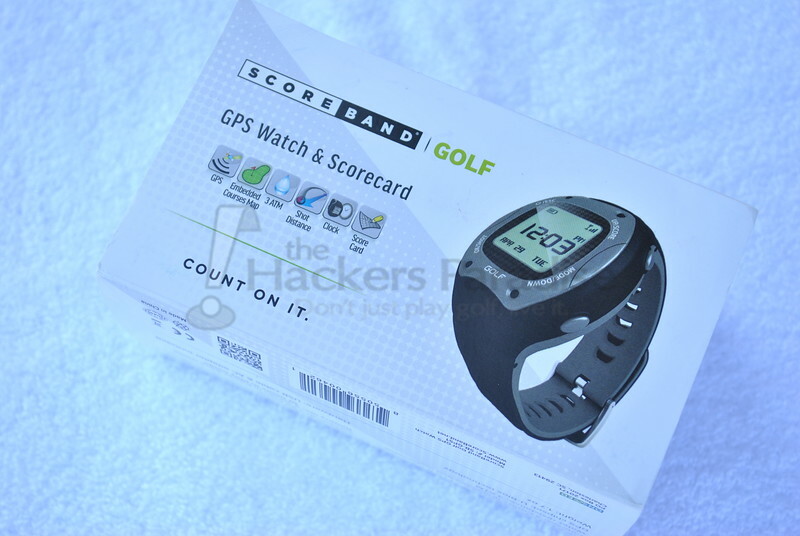 For ScoreBand Golf the focus is twofold; first, to provide a device that is accurate and easy to use, and then to hit a price point that is considered much more reasonable than some of the other popular units on the market. 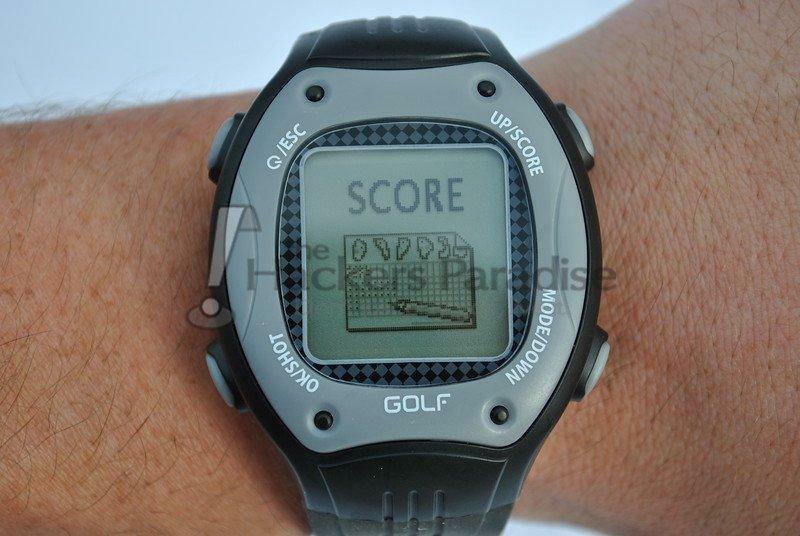 The ScoreBand GPS watch is a bit of a throwback as far as GPS watches in golf are concerned right now. The trend has been to go more and more ergonomic, making them appeal more to the masses by being less cumbersome than they were in their initial versions. With the ScoreBand, the size is going to be what sticks out most to people in the sense that it is not following the trend of the smaller profile. It’s a larger-style design that sits quite thick and wide on the wrist of the user. 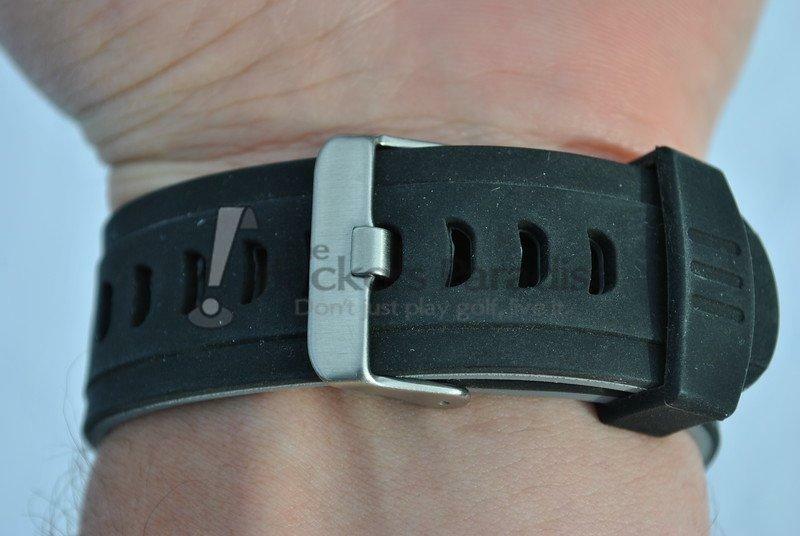 For this reviewer it was definitely more noticeable in the swing than some of the other GPS watches that have been tested and this could certainly pose an issue for some (though attaching the unit to the bag could remedy this). It is probably best to keep in mind that for this price point ($149.95), being a bit less ergonomic can be rationalized more. The watch is a simple black and grey design with a square body/face and a good size 90×90 pixel screen. The overall labeling on the four buttons is clearly visible, though (as will be touched on in a bit) it could be more streamlined to inform fully of how to access all the features. The band on the watch however is easily the most durable and comfortable that this reviewer has seen on a device like this. It’s incredibly heavy duty and secures without issue throughout a round of golf swings. As is pretty much standard, the ScoreBand GPS Watch utilizes a USB clip charger – nothing fancy here, but a nice touch is that during charging the watch screen will actually display the battery level in percentage rather than simply stating that its charging. Setup is simple: after powering on the watch with the labeled button (if it isn’t already on and being used in watch mode) the user presses the mode button until reaching the “play golf” screen and after hitting OK will select to keep score or not and how they want to locate the course. Courses can be selected either automatically or manually, and from there will load up starting on the 1st hole. After rounds of golf, the scores are saved (if using that feature) and the ten most recent rounds can be viewed on the watch. This feature is extremely easy to use and very handy when it comes to entering scores for handicap if you don’t want to carry a scorecard with you. In the end, the thing that matters the most about any type of GPS device is performance and ease of use. As mentioned in the previous section, the setup of the ScoreBand GPS Watch is straight forward and simple, and with access to over 27,000 courses it will almost certainly have you covered when it comes to traveling. 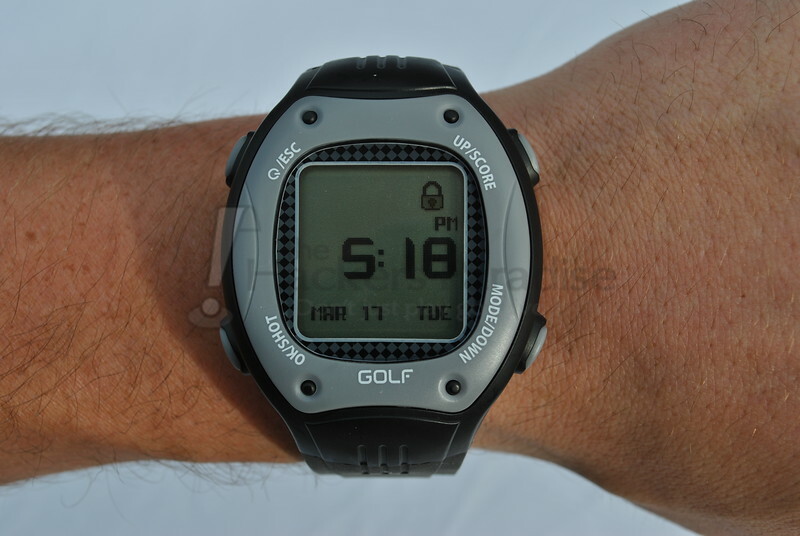 The satellite link-up of the ScoreBand is what shined the most during review, as it was consistently the fastest of the three watches this reviewer was comparing as far as locating and loading the course is concerned. Something to note with the automatic course lookup is that it will list all courses within a rather large radius. The closest is always listed at the top, but it could cause a bit of confusion for some if not paying attention. While the menu setup is easy to navigate, the overall setup of the watch in terms of its additional features like shot tracking, score, and hazards are doubled up on the four buttons the watch features. The user needs to hold the button corresponding to that feature for two seconds to access it. This is where a 5th button like some of the other watches out there would come in handy. 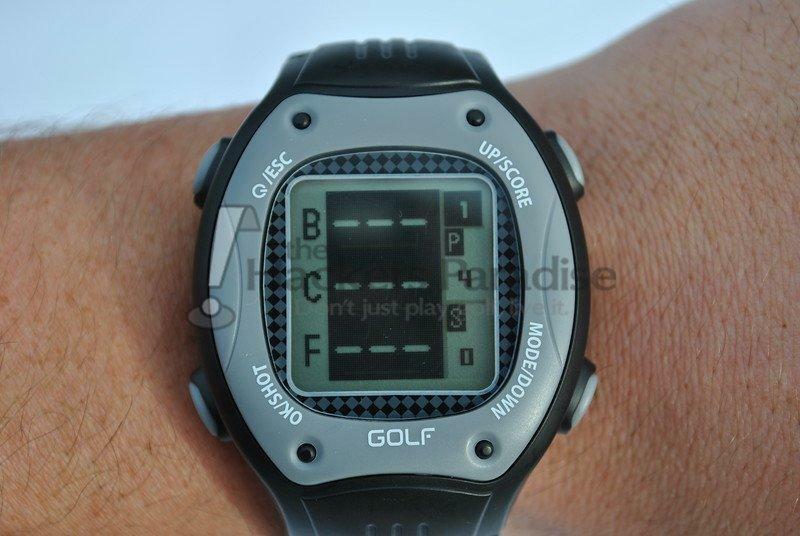 While the score and shot tracking buttons are labeled, the hazard button is not because it already has two menu functions listed on the face of the watch. While this is not a big deal after some time getting acclimated to the unit, it could cause new users to miss out on the feature initially. 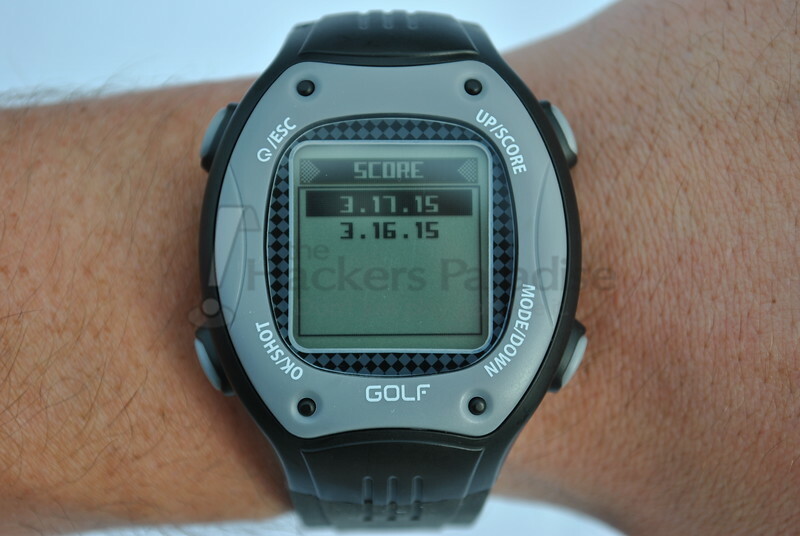 The accuracy of the ScoreBand GPS Watch was within 1 to 2 yards of all other devices it was tested. With a watch this is an acceptable margin and at no point was there anything glaringly off with the front, center, and back of the green numbers it provides. Where the hazard accuracy is concerned the watch was well within margins as well, though as with the majority of other GPS watches it may not list every hazard. However, all pertinent hazards were marked for this reviewer on the courses it was tested on. The unit maintained a very good battery life, allowing 3 to 4 full walking rounds to be recorded on one charge. Obviously though, this will vary with the user and the pace of play. One cannot help but wonder if the size of the unit plays a role in the better battery life (i.e. larger unit means larger battery). In a rather interesting move, the watch also features a backlight. While this would be useful at dawn or dusk, the only other use would be if the unit is being worn as an everyday watch and it is doubtful the size will be appealing enough for many to do so. In a golf world that is still divided between the usefulness of GPS versus a laser, many people wind up making their decisions based on price. While all of the different measurement devices carry a pretty significant price tag, GPS watches have started to provide a somewhat more affordable option (depending on the unit). With their GPS watch and scorecard, ScoreBand has hit a price point ($149.95) that will definitely catch more eyes, even with its larger size. The performance is there and it does what it claims to do very well, though it isn’t the prettiest or slimmest offering on the market. If you want the ability to look down, get your numbers and go, then the ScoreBand can certainly accommodate that. For more information on the ScoreBand GPS Watch and Scorecard can be found at www.ScoreBand.net. Another great review James. 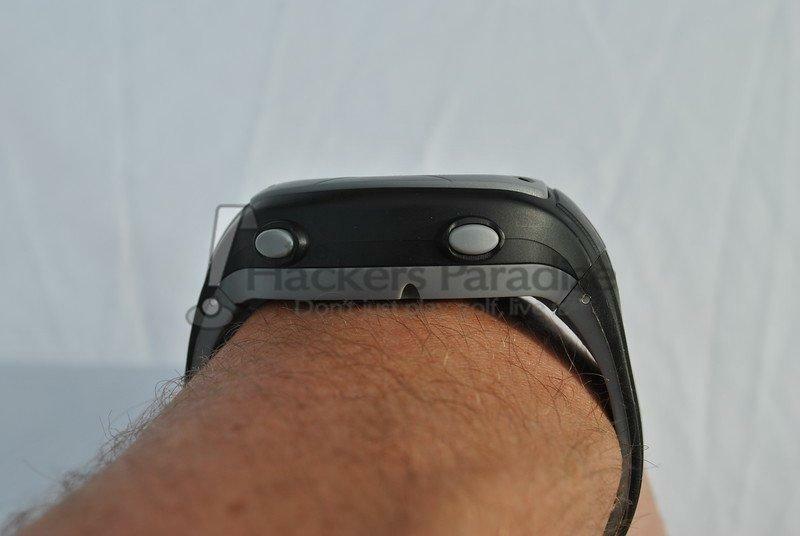 As you said, it’s not the prettiest/slimmest GPS watch on the market but it sounds like it is a solid performer. The battery life is good and I really like not having the added cost of a subscription. At this price point it is definitely worth checking out. As I look for a GPS watch or voice type caddy, this is one I’ll definitely look at. Thanks for an excellent review. I’m interested in the scoring features. I have the Neo XS and it does a fine job with GPS but not much help for tracking shots, putts, fairways hit, etc. How does this device do on that front? And how do you get the info off the watch and into an app or some other useful place?